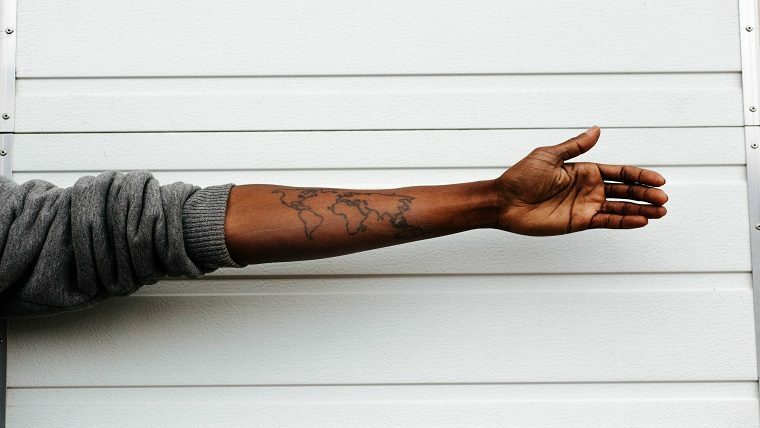 How many of your communication habits change when you cross borders? Whether you are traveling for personal or professional reasons, a shift happens when settings change and it often catches us off-guard. Culture flows and progresses through marriages, markets, movement, and time. How can we communicate within evolving cultures and how can we be sure we’ve been understood? And as creative expression through entrepreneurship steadily grows, what now? So much of communication and language is soaked with cultural rituals and behaviors. When reading the book The Culture Map by INSEAD professor Erin Meyer, we unravel deeply ingrained beliefs that live within language and immerge ourselves into a deeper understanding. Meyer frames everything under the guise of context, defined as the way messages are conveyed using either single or multiple layers of clarity. The opening quote illustrates this point: it is within the unspoken words of context that relationships are formed. 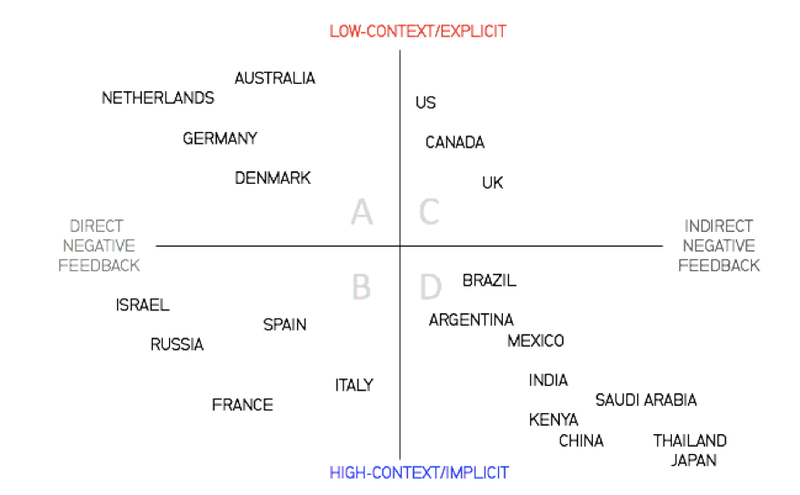 How different cultures use low-context and high-context is outlined in this chart. Illustrated here is the breadth of cultural context within communication. On the left side of low-context, the message is precise and clear. The children are often taught, “Say what you mean and mean what you say.” On the other end, high-context communication is nuanced and multi-layered. If the words spoken flow like water, what is implied is the undertow guiding the force, and what is explicit is visible to the naked eye, like waves. The right side looks for additional meaning when speaking to someone on the left, who is speaking at face value. Meyer suggests repetition to hinder misunderstanding. Consider the difference among cultures: in the East it goes Year, Month, and Day. In the West, the month and day are interchangeable, but both rank before the year. Think of this as a representation of macro and micro cultures- macro maintains a wider picture and places the community first, while micro magnifies the self and the now. Understanding how cultures rank their individuals creates opportunities for a persuasive argumentation. The following graph illustrates how this relates among a variety of cultures based on whether they value principles or applications. In other words, thought vs. action. On the right hand side, applications are HOW you make your case. Your message sources a fact or a statistic, grows into a confirmed statement, and is enriched with opinions and concepts. Additional tools, like an executive summary, drive the point home. Concrete and practical discussions will follow. Using theories and philosophies is not advised at peak persuasion stage. On the other column, principles are WHY you are making your case. Each concept must first outline a belief that motivates action. The process is structured by identifying this belief, or principle, and building an argument from it. A discussion can evolve into a debate that strays away from the meeting agenda, but Meyer explains that the principles-first participants might deem this time very well spent. No matter which side of the graph you are on, take a moment at the end of the meeting to outline what has been evaluated and agreed by everyone in attendance. If you are the one communicating, employ one or all of the following tactics: expand and thoroughly outline the outcomes and intended goals. Remember that pushback is a good thing. You may employ help from a local that can provide a cultural buffer. And finally, don’t be afraid to use humor, specifically self-deprecation. Laughing at your errors allows you to take blame for potential misunderstandings, making room to ask for help. Now let’s imagine you are a boss, and need to reprimand an employee on an unmet target. Would you lay it out sharp and direct and give no room for misunderstanding, or would you use words of encouragement interspersed with what could have been improved? What is the best way to give feedback? In the following graph, Meyer ranks high- and low-context cultures based on how they give direct or indirect negative feedback. Cultures in Quadrant B are complex: they communicate by both “reading the air” of unspoken messages, and simultaneously giving negative feedback. “Russians, for example, often pass messages between the lines, but when it comes to criticism they have a directness that can startle their colleagues,” says Meyer. Compare that with quadrant C, where the US is described as one with methods often baffling to cross-cultural colleagues, “Americans are famed for their lack of subtlety, and will always call out the elephant in the room, quickly,”explains Meyer. The relationship is ripe for strife unless measures for clarity are outlined in advance. Generally speaking, avoid direct confrontation. Language might need to become low-context, leveled for explicitness and transparency. Create an approach that balances negative and positive feedback equally. Acknowledging or reprimanding an action as it happens, instead of postponing it to a later date, avoids catching someone off guard. Replace singling out personal flaws with focus on the outcome of the work. Do not attack on a personal level, and focus solely on professional behavior. Be clear that you are giving feedback and do so privately. In Quadrant D, Meyer is clear that members of these cultures may require specific attention. When giving negative feedback, frame what you’re about to do by explaining possible differences in feedback methods, while showing both appreciation and respect. Many cultures here consider the concept of “saving face” to be vital. Ed Dean, a THNK class 7 participant and a UK executive with 12 years of creative leadership experience in Shanghai, observed, “The thinking is to create a sense that people will be punished publicly, which guides behavior principles. The Western system is largely morally driven, so that you behave based on your internal sense of honor.” No matter the context, it is a leader’s duty to maintain a person’s humanity without attacking their work or their culture. Basic politeness, though at times subjective, will get you very far. Naturally, this spans into a discussion of decision-making processes, and how they vary per culture. On the consensual side of the graph is where decisions are made by unanimous agreement. Opinion is encouraged. 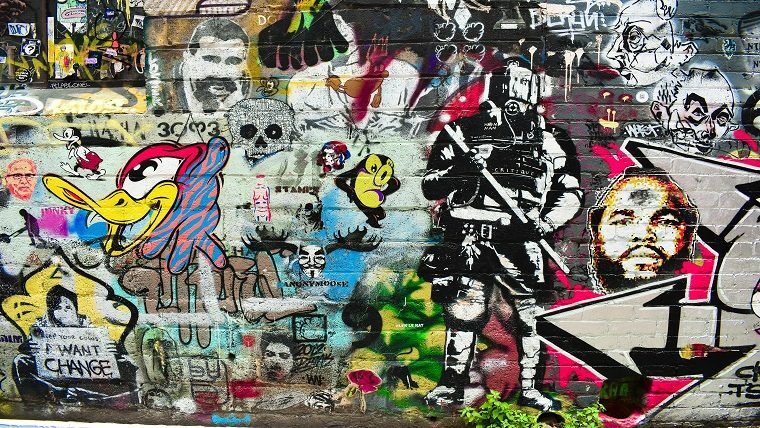 Individuals feel they have a voice and collectively consider their way to be a form of modernity. It feels like being in a tribe, and the opposite forms of leadership appear rigid and outdated. Top-down decision-making systems – those made by individuals, often the boss – are considered oppressive to outsiders. Context here, again, is key. Meyer suggests to instate a system of dividing decisions on a scale of Big D and little d. Be explicit: instating office casual Friday is a little d. Actively pursuing opportunities in a foreign market, Big D. Clarify your team’s cultural position on the Decision graph above, but also be keenly aware which method benefits the ultimate purpose. Japan may be the most consensual society, but their system is designed in a way that speeds up implementation. If everyone has been made part of the process along the way, through both formal and informal discussions, it is easier to get everyone to agree and be clear about their role. This is called nemawashi, a botanical term that defines a preventative root-binding method to protect against external damage. Japanese companies rarely disagree once the long, arduous process of making a Decision has been finalized at employee-level. All that’s left now is to go ahead and do it. With this Confucianism, Meyer begins to tackle the puzzling topic of leadership roles in cultures. Take a look at the following graph. Members of cultures that abide by hierarchical leadership models give greater weight to the perception–and aura–of a leader. Egalitarian cultures, on the opposite end, treat leaders in ways that would shock members on the lower rung of the hierarchical scale. Egalitarianism, derived from the French word of equality égalité is where leaders are members of the team. The managing director might ride his bicycle to work and wear jeans to the office. The employees feel free to disagree openly, even in front of others, within the confines of encouragement. On the right hand side, employees require confirmation from the boss before moving forward. Hierarchical rankings are enforced and you might attend meetings where the bosses speak first, then the second in command, and onward down. Rankings are respected and followed, sometimes through fear or obedience. If you are venturing into a new culture and neither are your style, how do you earn trust? Do you prefer to keep a large space between practical and emotional? To be clear, are you a peach or a coconut? On the left side, trust is earned through shared tasks. Show yourself to be reliable and consistent, keeping a theme of “business is business”. The countries on the right spectrum need for relationships to develop over time, and trust is built by sharing meals and coffee, personal stories, and attending team events. Guanxi, the Chinese concept of investing time and energy in building a personal connection, asks for two people to forge a relationship by opening up the personal sphere: share stories and commonalities over meals. The Japanese and Korean cultures use this approach, all the while abiding by a hierarchy. A requirement in the company is to let your hair down, figuratively, by going for drinks, karaoke and engaging in general rowdiness. A new work week will resume on Monday as normal, but the boss has seen that you are willing to let go of your inhibitions. Among certain cultures, this is how trust is forged. On the left side of the column are the peaches, friendly and jovial. They smile often and ask personal questions with ease. However, when it’s time to get to the core of the person, you’ll find a hard and impenetrable shell, where work and personal lives are clearly marked. Coconuts, to the right, are hard to break into and appear rigid and cold. They might not smile much or share personal information, which may block relationships from growing. Once the barriers come down –and prepare for it to take some time– longer-lasting relationships begin to bud. As the expectations of relationships begin to form, know your preferred method of leadership and make it clear from the start. Introduce your objectives from the start. Make the effort. Understand what is respected among the cultures you will deal with, and approach the best methods for desired outcome. Know when to pick up the phone, instead of email; when to get on a plane and talk in person, not Skype. What is appreciated and understood as a gesture of bonding? The sooner a team becomes aware of how culture impacts their work, the sooner they can begin to turn their differences into opportunities. Culture profoundly impacts the way we see the world, and under the guidance of a creative leader can be successfully channeled within a successful multifaceted venture. Consider the action points already highlighted in this article as a vision for potential speed bumps up ahead. Meyer suggests adopting a leadership style inspired by the Chinese culture, which blends flexibility and reactivity. Note how the most productive meetings are borne from unpredictable conversations: as a leader, how do you capitalize on the energy that is created? Play Devil’s Advocate often to create room for discussion. Stay nimble and flex your style as the situation at hand requires, in maintaining the balance of short term and long term planning. For today’s creative leader, reactivity is key so consider all plans flexible, and allow this to improve your skill sets, relationships and the formation of ideas. Agree to everything in writing, so it is clearly part of the company’s – not the country’s – culture. Value this last point above all. Creative leaders conduct their teams by understanding the traits required for the success of both business and team. It is vital to understand which actions and beliefs are unique to the individual, and those that are culturally ingrained. Culture lives deeply within all of us, and yet it is never the only way to understand a person’s goals, interests and preferences. Begin your relationships by understanding the person within the culture and setting, and you are on your way to communicating across cultures. To discover how you can better communicate across cultures, join the upcoming Executive Leadership Program. Find out if you qualify or download the program brochure on the program page.